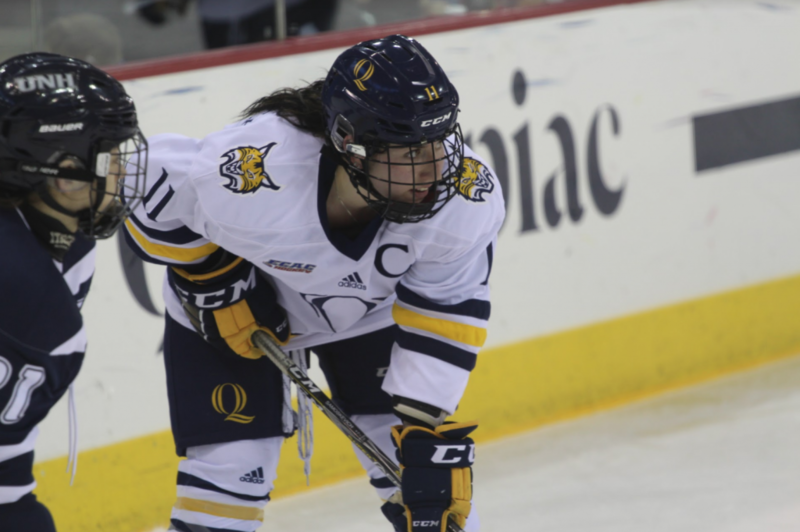 The Quinnipiac women’s ice hockey team comes into the weekend series against Maine with an 0-2 record after being swept last week by No. 7 Ohio State. This will be the Black Bears’ first regular season game after a 7-0 exhibition win against the University of New Brunswick. Maine made it all the way to the Hockey East semifinals last year before falling to Northeastern. The freshman from St. Thomas, Ontario notched her first collegiate points last weekend against Ohio State, getting two assists in the season opener on Friday. She also fired off nine total shots in the series, two in the first game and seven in the second. Adzija was named the ECAC Hockey Rookie of the Week for her achievements. It’s early on, but Adzija seems to be providing some offensive push that is very much needed. The team’s offense struggled last season, scoring only 1.81 goals per game, so Adzija’s early presence is something to look out for. Although it was only an exhibition, Tedenby made an impact in her first game at Maine, registering two goals and two assists in the win. The Swede was among six newcomers to get a point in the game. Coming over from Europe, Tedenby has tons of international experience, representing Sweden three times at the U-18 World Championships. She’ll look to continue her hot start into the regular season. The offense was one of the biggest problems for the Bobcats last season. Averaging less than two goals per game last year isn’t ideal and the team was able to stick around in games because of their defense and goaltending. While scoring two goals in both games against Ohio State is better than last year’s average, it was clear it wasn’t enough as they couldn’t get the victories. The offense needs to find a way to put the puck in the net multiple times in the game if they want to improve from last year. Maine scored most of their goals early last year. 39 of their 91 goals were scored in the first period, good to tie for second in Hockey East in that category. The team was 17-1-2 when leading after the first period last season, but were 1-9-0 when losing after the first. So the Black Bears need to find the twine early on and build the lead before the first buzzer. Be sure to tune into the broadcast of the game between Quinnipiac and Maine at the People’s United Center at 6 p.m. Friday. On the call will be M.J. Baird and Bryan Murphy. Follow @QBSN on Twitter to get updates on the game.